In the spirit of back-to-school, here are 26 great egg recipes for lunches, breakfasts, snacks, and more. 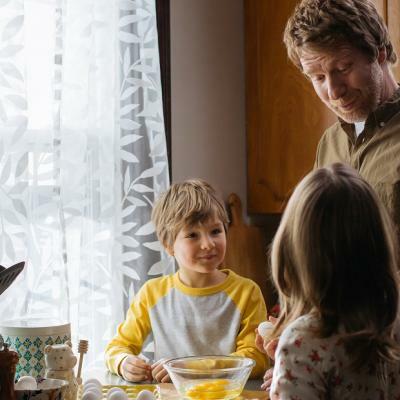 From Apple Pancakes, Ham and Cheese Omelette Roll-Ups, and Quick Morning Pizza to Kid-Friendly Cobb Salad and Fudgey Brownies, we’ve got recipes that get top marks for deliciousness and nutrition. A – Apple Pancake – Make this for Sunday breakfast and then heat up the leftovers for the perfect Monday morning breakfast before school. B – Bagel ‘n’ Egg Melts – These open-faced bagel sandwiches are a quick and easy lunch or after-school snack. C – Cobb Salad – You may think we are "out to lunch" with this suggestion but kids will love this Cobb salad – it’s garnished with all their favourite toppings. Send it with them to school for lunch or serve for an easy and nutritious dinner. 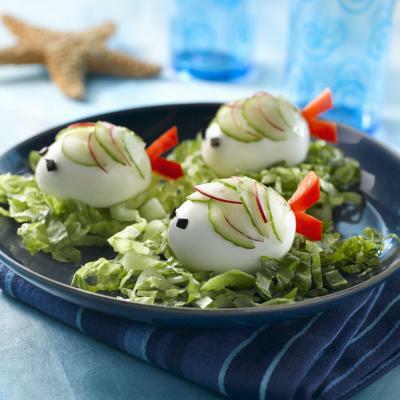 D – Devil Eggs – Kids will enjoy making these fun devilish snacks – as much as they will enjoy eating them! E – Egg in a Potato Nest – Hash browns form a little nest for a sunny egg. This breakfast is quick to make on busy mornings. F – French Toast Stuffed with Bananas and Strawberries – Turn classic French toast into stuffed French toast––fun for kids of all ages and great for sleepover breakfasts. G – Good Morning Casserole – Filled with eggs, bacon, mushrooms and oozing with Cheddar cheese, this Good Morning Casserole is an easy way to get the kids out of bed. H – Ham and Cheese Omelette Roll-Ups – This is the perfect breakfast for your kids to eat on the way to school. I – Italian Zeppole – Your kids are going to love if you start making them doughnuts! 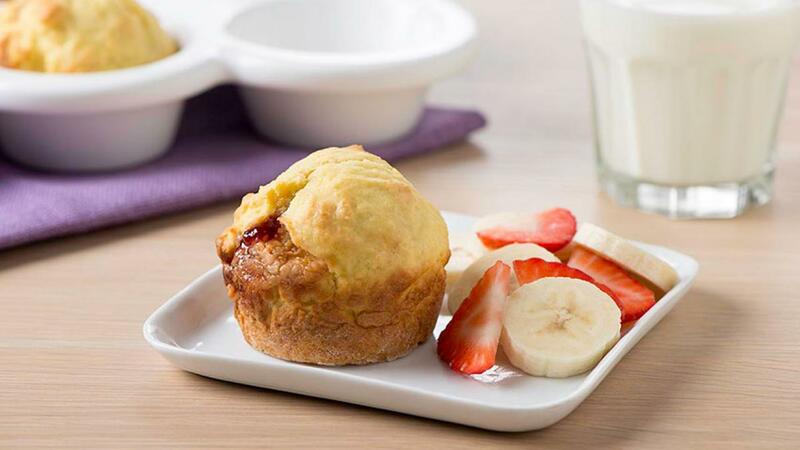 J – PB & J Mini Pancake Cups – Kids and adults alike will greet weekday mornings with a smile thanks to these portable PB & J (J for jam, of course) pancake cups! K – Krinkle Cookies – The perfect treat for your child's lunchbox. L – Lemon and Blueberry Cottage Cheese Muffins – Need a snack for you and your kids while running errands? Try these muffins! M – Mini Ham and Cheddar Frittatas – These mini frittatas are just the right size for little fingers as a breakfast on the go or an after-school snack. N – No-fuss Egg Wraps – This weekday breakfast option is good for adults and kids alike! It’s the perfect meal to take on the go if there’s no time to eat at home. O – One Bowl Banana & Chocolate Chip Muffins – Because who has time for dishes? P – Pizza Egg Melts – Rise and shine to these three words: pizza, egg, melts. Mmmm. Q – Quick Morning Pizza – Pizza for breakfast! The kids will love this quick and easy breakfast recipe. R – Raspberry Meringue Bars – If you are short on time, this dessert comes together pretty quickly and is a hit with the little ones. S – Sunny Egg Face – Let the little ones play with their food in decorating these simple omelettes. T – Toffee Meringue Kisses – Just when you thought meringue couldn't get any better someone thinks of adding chocolate chips, toffee bits and pecans! U – Unbelievably Fluffy Pancakes – A stack of warm, fluffy pancakes are sure to bring smiles to even the groggiest early morning risers. V – Veggie Sunrise Peppers – Sweet peppers make ideal individual cups for this quick breakfast. W – Weekday Kale and Sausage Frittata Cups – This frittata recipe is endlessly customizable; switch up the filling ingredients based on your kids' preferences. 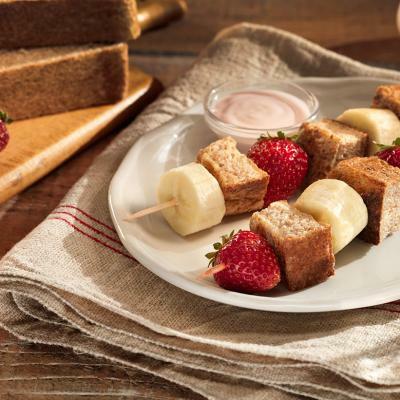 Make this recipe on Sunday and your kids will have a week's worth of breakfasts ready-to-go! X – Eggs-tra Special French Toast – Make breakfast “X”tra special with the addition of strawberry cream cheese and jam in their breakfast. Y – Yummy Fudgey Brownies – Fudgey brownies are every kid's favourite. These brownies make a decadent dessert and are a great recipe for any bake sale, potluck or birthday celebration. Z – Chocolate Zucchini Cake – Your kids won't taste the zucchini, we promise!